To reach our officers, see the Contact page for options. Irish Music is music that has been created in various genres on the island of Ireland. The indigenous music of the island is termed Irish traditional music. Despite globalizing cultural forces, it has remained vibrant through the 20th and into the 21st century. 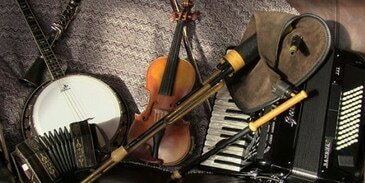 Irish traditional music has kept many of its elements and has itself influenced many forms of music. In art music, Ireland has a history reaching back to Gregorian chants in the Middle Ages, choral and harp music of the Renaissance, court music of the Baroque and early Classical period, as well as many Romantic, late Romantic, and twentieth-century modernist music. It is still a vibrant genre with many composers and ensembles writing and performing avant-garde art music in the classical tradition. Irish dancing or Irish dance is a group of traditional dance forms originating in Ireland which can broadly be divided into social dances and performance dances. Irish social dancing can be divided further into céilí and set dancing. 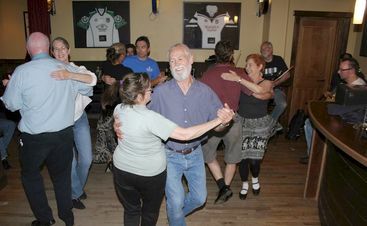 Céilí dances are danced by varied formations of two to sixteen people and set dances are quadrilles, danced by four couples arranged in a square. Irish step dancing, a performance dance popularized in 1994 by the world-famous show Riverdance, is notable for its rapid leg and foot movements, body and arms being kept largely stationary. The solo step dance is generally characterized by a controlled and rigid upper body, straight arms and back, and quick, precise movements of feet and legs. The solo dances can either be in "soft shoes" or "hard shoes". Irish sean nós dance ("in the old style") is an older style of traditional solo Irish dance characterized by its "low to the ground" footwork, improvised steps, free movement of the arms, and an emphasis upon a "battering step." See our regional set dancing page for a description of public dance events sponsored by CCE Puget Sound. Irish sean nós singing ("in the old style") is an unaccompanied form and is considered the ultimate expression of traditional singing. This is usually performed solo (very occasionally as a duet). Sean-nós singing is highly ornamented and the voice is placed towards the top of the range. A true sean-nós singer will vary the melody of every verse but not to the point of interfering with the words which are considered to have as much importance as the melody. To the first-time listener, accustomed to pop and classical singers, sean-nós often sounds more "Arabic", "Persian", or "Indian" than "Western". Contemporary traditional singing, even when accompaniment is used, often has patterns of ornamentation and melodic freedom derived from sean-nós singing. The Irish language (Gaeilge), also referred to as Gaelic or Irish Gaelic, originated in Ireland and historically has been spoken by the Irish people. Irish enjoys constitutional status as the national and first official language of the Republic of Ireland and is an officially recognized minority language in Northern Ireland. It is also among the official languages of the European Union. The public body Foras na Gaeilge is responsible for the promotion of the language throughout the island of Ireland. Irish was the predominant language of the Irish people for most of their recorded history and they brought it with them to other regions, notably Scotland and the Isle of Man, where Middle Irish gave rise to Scottish Gaelic and Manx respectively. The Irish have the oldest vernacular literature in Western Europe. For additional Irish cultural programing in the Seattle area, visit the site of the Irish Heritage Club of Seattle (Cumann Oidhtreacht Gaelach Seattle).